Kristina Sciarra Sharp loves cookbooks. She reads them cover-tocover, gleaning techniques and ideas as well as recipes. She likes David Chang’s Momofuko, and Thomas Keller’s Bouchon—which inspired the pas de choux gnocchi on the menu at Lagom in Havre de Grace. The puffy potato flour pasta is an airier version of the classic dumplings made from shredded potatoes. Today it’s tossed with pesto made from African blue basil that Sharp grows in the basement, warm cherry tomatoes and wilted spinach; and it’s topped with fat seared shrimp. 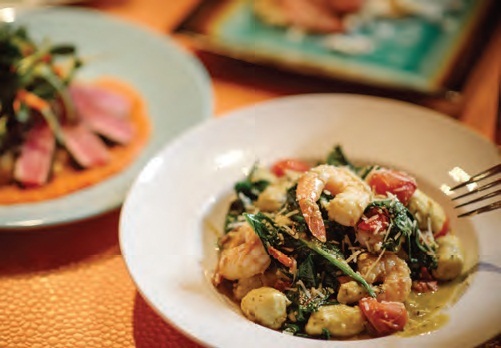 “I used to call gnocchi little sinkers,” says the chef, who appeared on the Food Network show Chopped in 2016. These delicate pillows are anything but. The dish is one of many on the table this afternoon, along with beer glasses, small and large. 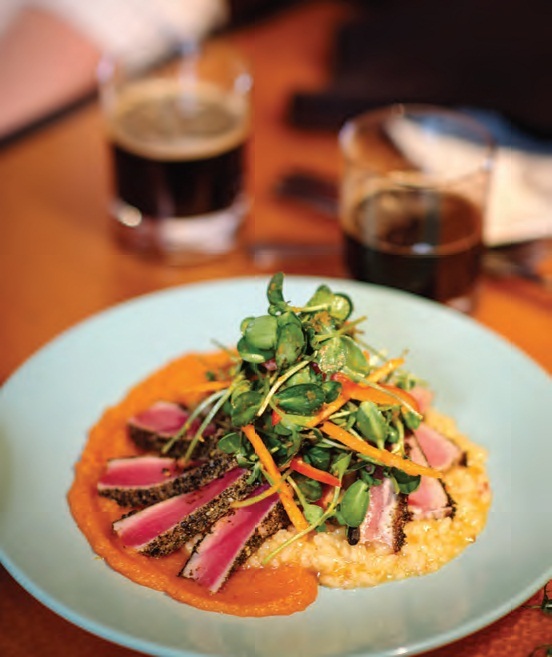 On the food side, there’s pork belly; a pea shoot salad with shaved baby carrots, pumpkin seeds and a lemony dressing; and tuna with a chili-spiked carrotginger puree atop risotto. There’s a generous serving of lamb chops, with creamy potatoes and grilled asparagus on the side, along with a mint and walnut sauce for swirling the tender meat. And there’s pizza; this one is the chef’s specialty, loaded with feta and asiago, roasted garlic, sausage and banana peppers. “But no onions,” she says, looking triumphantly at Phillip Rhudy, across the table. “No onions,” he repeats. The two high-five. Their spouses, Beth Anderson-Rhudy and Janice Sharp laugh. Apparently Phil Rhudy doesn’t like onions. 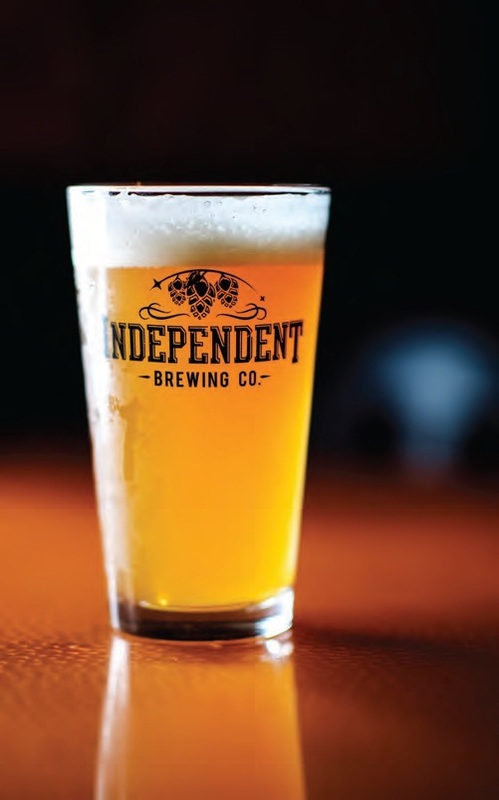 The Rhudys, who own Independent Brewing in nearby Bel Air, are responsible for the beer. There’s a dark, chocolate and coffee-tinged oatmeal stout called Cereal Killer (Yes, try it for breakfast.) and Chesapeake pale ale brewed with locally grown barley. A few selections appear to be a tribute to the current White House administration: Bad Hombre is crisp and malty with southwestern-style hops; Alternative Facts an easydrinking— or session—IPA; and Nasty Woman, another IPA, is New Englandstyle with notes of citrus. The latter made it to the second round of the Great American Beer Festival competition, one of more than 400 entries, Phil tells me. 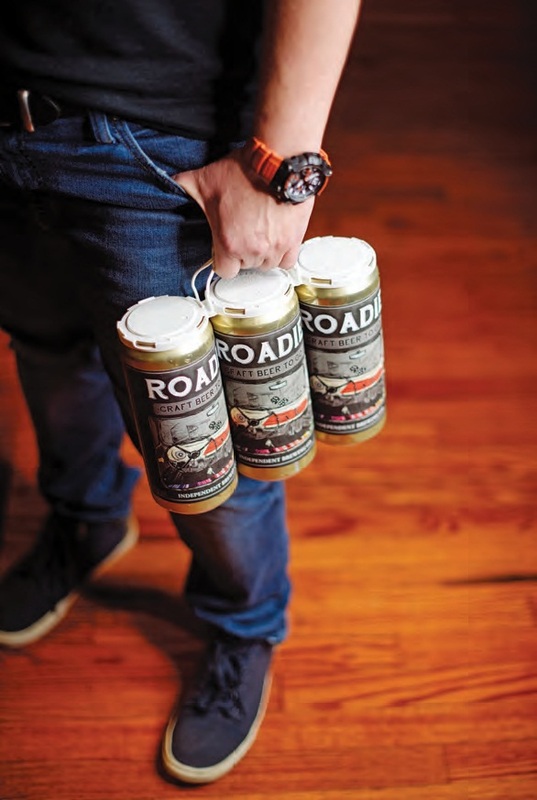 A retired driver for United Parcel Service, Phil Rhudy has been drinking craft beer for three decades, and he can trace his passion to a brewery just down the road on the Eastern Shore. “The beer that changed the world for me was Snow Goose,” a brown ale made by Wild Goose, a Cambridgebased brewery that was later purchased by Frederick Brewing. 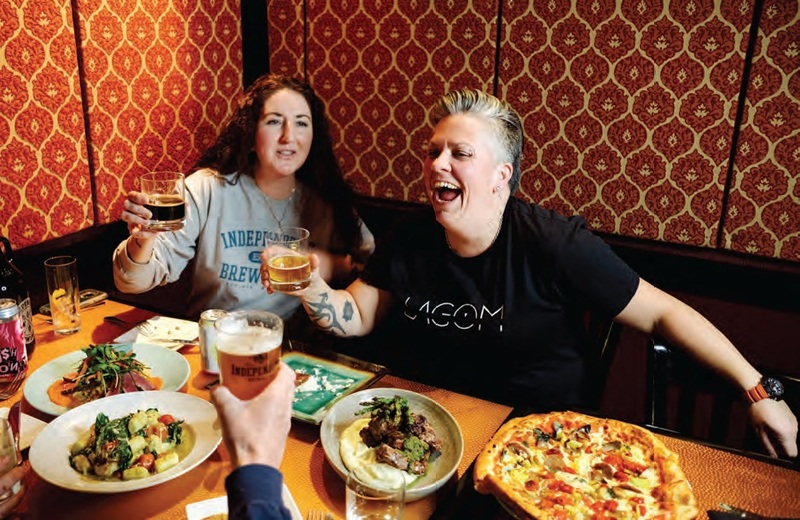 At Lagom, which opened in early 2018, Kristina and Janice Sharp haven’t yet focused on décor. The couple met here, when the Washington Street restaurant was the Laurrapin Grille. Janice was a server when Kristina came to work in the kitchen, and they were both promoted in 2010, Janice to manager and Kristina to sous chef. After a stint opening the Italian restaurant Birroteca in Bel Air, Kristina returned in 2016, and she and Janice, who had been dating almost since they met, began the process of purchasing the restaurant. They were married in 2017, with Janice’s two boys, now aged 11 and 13, part of the wedding party. 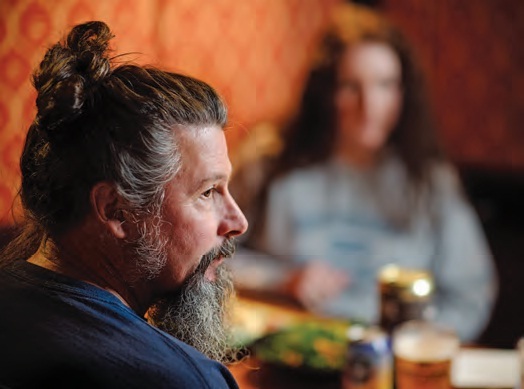 The couple ran the restaurant with the Laurrapin name for the first year, transitioning to Lagom (a Swedish word meaning “just the right amount”) in 2018. “We had to prove ourselves,” says Janice. “We wanted to be more of a contemporary American restaurant with homecooked food.” Kristina remembers her Italian great-grandmother with fondness. “From the time I was old enough to see over the table I was in the kitchen with her,” says the chef. Her grandmother had a vegetable garden, so most meals began with fresh produce. Today, Lagom sources ingredients from such local farms as Third Way in Havre de Grace and Flying Plow in Rising Sun. Kristina also has a small hydroponic garden in the basement and a small herb garden behind the restaurant. Lagom’s owners try to use as many local products as they can. And that includes the beer that flows from the taps. Facing page, clockwise from top left, Phillip Rhudy of Independent Brewing in Belair; risotto topped with tuna and carrot-ginger puree; Independent’s Roadie cans, filled to order with whatever beer the customer wants to take home.